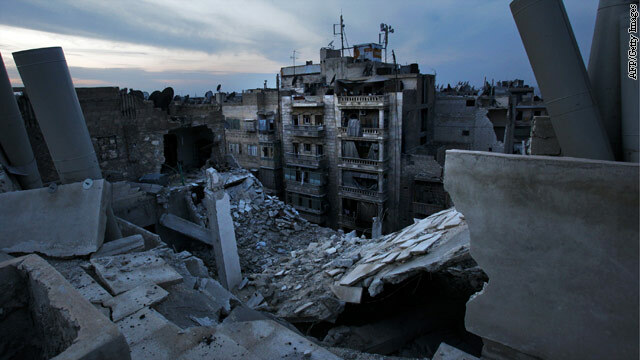 A picture shows the damaged houses in the northern city of Aleppo on November 29, 2012. A regime air strike on Aleppo killed at least 15 civilians, including five children, the Syrian Observatory for Human Rights said. The United States is concerned that Syria may be "cooking up recipes" at multiple sites to arm chemical weapons, a U.S. official said on Tuesday. CNN reported on Monday that Syrian forces battling rebels in fierce fighting had started combining chemicals that could be used to make deadly sarin gas for weapons. The official would not detail more on intelligence developments, but said the United States is concerned about possible preparations at more than one chemical weapons plant around Syria. The official would only say it was a "small number" of facilities where activities are taking place. The Syrian Foreign Ministry denied that the country has any plans to use chemical weapons, state TV has reported. The government likewise has repeatedly stressed it will not use such weapons, if they exist, against its people under any circumstances. The U.S. military believes there are 50 chemical weapon and production sites spread across the country with additional storage sites and research centers as well. Syria is believed to have one of the most advanced chemical warfare capabilities in the region, with the ability to develop and produce agents such as mustard gas, sarin and possibly the VX nerve agent, according to information collected by the Nuclear Threat Initiative, a non-profit group that seeks to reduce the risk of use of chemical, biological and nuclear weapons. American intelligence shows activity at certain facilities and no evidence that anything had been moved out of them, several senior U.S. military officials said. While they would not describe the activity, the officials said there was no sign that showed Syria was ready to do anything with chemical weapons. Officials explained that some types of chemical arms require mixing before they can be weaponized. None of the officials who spoke to CNN would discuss the issue for full attribution due to the sensitivity of the issue. The intelligence was strong enough for President Barack Obama to issue a public warning to Syrian President Bashar al-Assad on Monday, according to one of the U.S. officials. I want to make it absolutely clear to Assad and those under his command - the world is watching," Obama said at a speech at the National Defense University in Washington. "The use of chemical weapons is and would be totally unacceptable. And if you make the tragic mistake of using these weapons, there will be consequences and you will be held accountable," he said. Despite the concern, military officials say there's no imminent plan for U.S. military action. But the military has been planning for various scenarios and has assets in the region should Obama order a strike. Officials note that regional allies like Jordan also have military capabilities and have been training, and are standing by. While officials would not discuss U.S. military options, military officials speaking more generally have said that striking the sites would not be a good idea because ensuing explosions would disperse dangerous chemicals. Senior U.S. military officials also said Tuesday that there was no indication the situation had deteriorated to the point where Assad would resort to chemical weapons, though rebels continue making advances. A U.S. official not in the military said that the opposition is "maturing" forcing Assad into a tougher position. "The regime's territorial control and influence appears to be narrowing. The will to fight looks like it's still there, but Assad's forces are struggling to beat back insurgent gains," the official said. weapons? or did they stop?It's a shame that Syria is believed to have one of the most advanced chemical warfare capabilities in the region. On Fox they must call this the Double Secret Blog. Send in Seal Team 69 with Nick Cage and Sean Connery. That will scare them to lay down their chemical weapons. But, but in the movie "The Rock" they were able to neutralize the VX gas using thermite plasma bombs 🙂 I guess that was just a load of crap! What Israel may well suspect is that North Korean and/or Pakistani nukes have been already smuggled into Iran, Syria and Gaza. US and Israel Intel saying that Iran's own Nuke effort is 6 months away, 1 year away or more is just a smoke screen masking the real proxy nuclear attack that may be ready now! The most recent 1000 Iranian rocket barrage from Gaza may only have been a test of Israel's Iron Dome ABM system. It is impressive, but will not stop a mass launch of hundreds of missiles from Iran, Syria and Gaza at the same time.Better take all three out first! Then Bulldoze Gaza into the sea.Screw the North Korean, Pakistani, Russian techs and scientists. They deserve to burn. Nuke the Russian base in Tartus, Syria too. That was the port of entry for Russian, Iranian and North Korean ships that smuggled in the nukes. Tartus hosts a Soviet-era naval supply and maintenance base, under a 1971 agreement with Syria, which is still staffed by Russian naval personnel. Tartus is the last Russian military base outside the former Soviet Union, and its only Mediterranean fueling spot, sparing Russia’s warships the trip back to their Black Sea bases through straits in Turkey, a NATO member. I am sure Russia has nukes stored there. Charlie, it is a slam dunk! I suggest that you suit up as Captain America and lead the charge! Good luck to ya! democrats need to invade syria, then will find out there are no weapon. Obama = Bush and vice versa. Let's not forget that the US backed Iraq with weapons during the Iraq Iran war in which the former Soviet Union was backing Iran. Let's not forget that Israel openly stated that it would attack Syria if Israel felt that the security of the chemical weapons was compromised. This threat by Israel has placed the US in a very percariou situation. Also there is no credible intel about Syria chemical stock pile. Only in the last week or two do the news networks start talking about chemical weapons. If Israel attacks Syria will have major implications in the region. Why should the US get involved now when the US and the world for the most part has done nothing to stop the bloodshed that has been and continue to go on. Well the USA should worry about our NATO partner, Turkey, having a love affair with Russia. This does not bode well for NATO secrets....The current President of Turkey is a very strict Islamist and they are not big fans of the USA ! Paul found salvation on the road to Damascus, now modern day Damascus is being destroyed, and the no man says not a word. Why are the people of the world calling Christ, the Son of David? *1st Samuel 18:18 And David said unto Saul, Who am I? and what is my life, or my father's family in Israel, that I should be in law to the king. A measure of wheat for a penny, and three measures of barley for a penny; (*Matthew 20:13 But he answered one of them, and said, Friend, I do thee no wrong: didst not thou agree with me for a penny? *) *Job 39:12 Wilt thou believe him, that he will bring home thy seed, and gather it into thy barn? *Matthew 13:30 but gather the wheat into my barn. Now therefore go to, speak to the men of Judah, and to the inhabitants of Jerusalem, saying, Thus saith the Lord; Behold, I frame evil against you, and devise a device against you: (Remember, God is the I and Joseph took the body of Christ) Lest Satan should get advantage of us: For we are not ignorant of his devices. I'd like to get a second opinion please....last time I heard about WMD's it was a lie to justify the U.S. doing whatever it felt like. Given the scale of escalation that can happen here I'd like a little better source. Speaking of the use of chemical weapons, who are we Americans to criticize others when we ourselves used them in Vietnam against the Vietnamese during the 60's and 70's? Hopefully, the Syrian government won't use them as this will give the U.S. and it's NATO cronies an excuse to attack Syria. This proves just morally unprincipled those morons in Washington and London really are!!! What is everyone's deal? The united states is only trying to keep freedom alive. I agree freedom isn't free, but at the same time the us just wants people's of power of other nations know that wrong is wrong and for every crime there is a punishment. If you uphold other nations makeing these type of weapons you might as well say that it's alright for crime lords of the u.s. to make drugs like meth that kills people everyday. bribarian: that was a really foolish comment in light of Assad's war on his own people. Here goes the right-wing news media again, trying to disinform us over the Assad regime in Syria now trying to "cook up" chemical weapons to use against "their own people". It's funny how this same media never mentions the atrocities committed by the so-called "rebels" which it calls "the people" against the civilian population. Talk about propaganda! Regardless of how objective or subjective you believe the media bias is, all credible intelligence by several diff. nations has pointed towards the manuevering of parts in order to coordinate a chemical/biological weapon attack. Whether you are for or against Assad, the rebels, or neither, the use of these chemical/biological weapons would be a horrible atrociety and can not be allowed to happen. Saddam would never have sent anything to an Iranian proxy state. More than a few bad feelings there. And you know this how? On, I keep forgetting, everyone here has double secret clearance from Rummie and Cheney (the dynamic duo of stupidity).